The December 2015 passage of the FAST Act was an important victory for the transportation construction industry. It will help inject much-needed stability to the market over the next few years. But, most glaringly, it neglected to provide a permanent revenue solution for the Highway Trust Fund (HTF). While the inclination for some in the transportation community is to hibernate for the next few years with the passage of the FAST Act, this is definitely not ARTBA’s plan. Ensuring a permanent HTF fix is included in any congressional tax reform or other major revenue vehicle. Making sure Congress actually appropriates the funding for the FAST Act’s highway and transit capital programs. This has become an annual fight as inevitably some lawmakers attempt to walk back what was included in the law. Obtaining a multi-year increase in airport capital improvements as part of the FAA reauthorization bill. 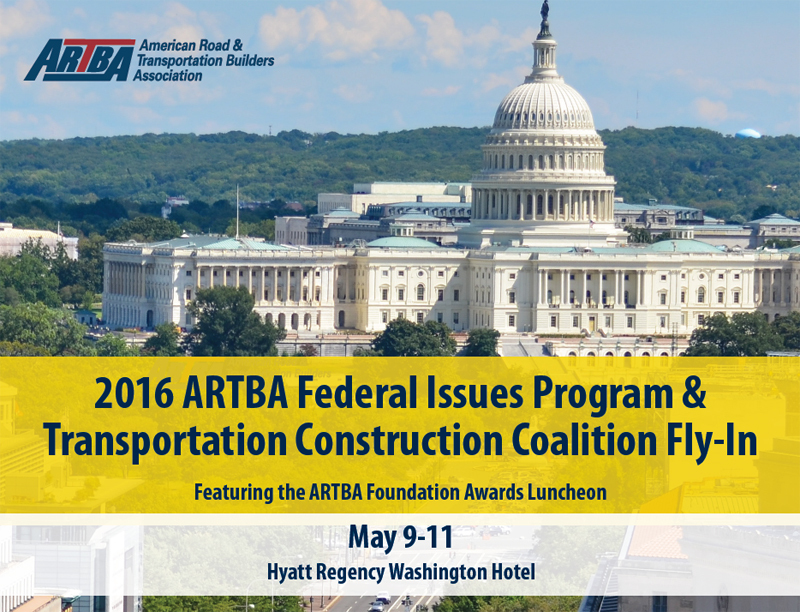 You will have an important leadership opportunity to communicate directly with your members of Congress on the need for action on these issues when you register for the 2016 Federal Issues Program and the Transportation Construction Coalition (TCC) Fly-In, scheduled May 9-11 at the Hyatt Regency Washington on Capitol Hill. A strong industry grassroots presence is critical, especially in a presidential election year that will likely be filled with campaign distractions. Our elected leaders need to understand that the job is not done. The FIP includes a special May 9 reception at ARTBA’s Headquarters Building for the formal unveiling of the Transportation Development Hall of Fame structure and recognition of the 2010-15 classes. It’s a special night you will not want to miss. Be sure to register now for the FIP and TCC Fly-In.